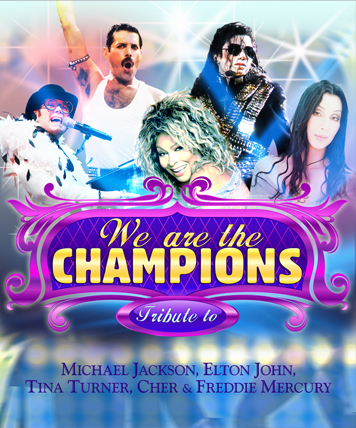 We are the Champions is the tribute of all tributes, as we celebrate the music of the greatest pop icons of all time - Michael Jackson, Elton John, Tina Turner, Pink & Freddie Mercury. All these unforgettable names on one stage in one show singing number one hits from the last 5 decades of pop and rock music. These artists have dominated the charts and influenced us immensely; we therefore refer to them as champions of our world and the music industry. The show features an 8-piece cast and the lead vocalists look like, sound like and pays tribute to these incredible artists with passion, soul and authenticity. Experience the vibrancy of Pink with hits such as Raise Your Glass, Perfect, So What, Just Like a Pill, Blow Me (One last kiss) and many more. The pop maestro Elton John is also honoured with the songs Crocodile Rock, Sad Songs, I’m still Standing, Candle in the Wind and many more. Tina Turner's music brings you the soul and passion of the Queen of Rock with hits like River Deep Mountain High, Proud Mary, The Best, Private Dancer and many more. The flamboyant Freddie Mercury is portrayed with all the glitz and glamour through the hits A Kind of Magic, Somebody to Love and more. The role of Michael Jackson is staged and performed with an uncanny resemblance to this pop icon. Experience a world class performance with the hits Billie Jean, Beat It, Black or White, Man in the Mirror and many more. We are the Champions is about showmanship, charisma and the passion of these Barnyard performers paying tribute to every nuance of these Champion Icons. Experience this phenomenal cast in a musical stage show that will have you mesmerised and screaming for more!